Being woken in the dead of night by noisy neighbours blasting out music could soon be a thing of the past. 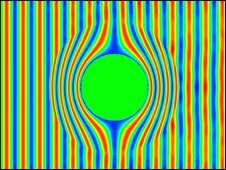 Scientists have shown off the blueprint for an "acoustic cloak", which could make objects impervious to sound waves. The technology, outlined in the New Journal of Physics, could be used to build sound-proof homes, advanced concert halls or stealth warships. Scientists have previously demonstrated devices that cloak objects from microwaves, making them "invisible". "The mathematics behind cloaking has been known for several years," said Professor John Pendry of Imperial College London, UK, an expert in cloaking. "What hasn't been available for sound is the sort of materials you need to build a cloak out of." The Spanish team who conducted the new work believe the key to a practical device are so-called "sonic crystals". 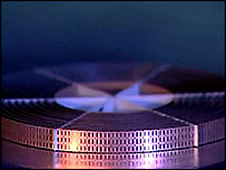 These artificial composites - also known as "meta-materials" - can be engineered to produce specific acoustical effects. "Unlike ordinary materials, their acoustic properties are determined by their internal structure," explained Professor Pendry. These would be used to channel any sound around an object, like water flowing around a rock in a stream. 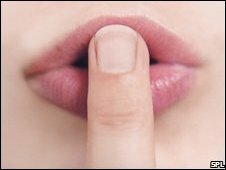 "The idea of acoustic cloaking is to deviate the sounds waves around the object that has to be cloaked," said Jose Sanchez-Dehesa of the Polytechnic University of Valencia, one of the researchers behind the new work. He believes a material that consists of arrays of tiny cylinders would achieve this effect. Simulations showed that 200 layers of this metamaterial could effectively shield an object from noise. Thinner stacks would shield an object from certain frequencies. "The thickness depends on the wavelength you want to screen," he told BBC News. Dr Sanchez-Dehesa now wants to make and test such a material in the lab to confirm the simulations. But researchers, such as Professor Pendry, believe the initial work is already an important first step. "It's not an unrealistic blueprint - it doesn't demand that we do extraordinary things," he said. "This is something that can easily be manufactured." If a material could be commercialised, both researchers believe it could have many applications. 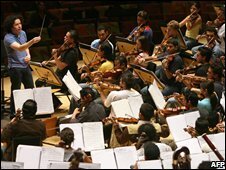 Walls of the material could be built to soundproof houses or it could be used in concert halls to enhance acoustics or direct noise away from certain areas. The military may also be interested, the researchers believe, to conceal submarines from detection by sonar or to create a new class of stealth ships. However, the material may need to be optimised first. "You don't want to wrap a submarine in something that is heavy and several inches thick," said Professor Pendry. "It would add quite a lot to the Navy's fuel bill, I think." The research builds on work by scientists from Duke University in North Carolina, US, and the Hong Kong University of Science and Technology. Earlier this year, independent teams from the two institutions demonstrated the mathematics necessary to create an acoustic cloak. Other scientists have shown that objects can be cloaked from electromagnetic radiation, such as microwaves. For example, in 2006, scientists at Duke University showed how a small copper cylinder could be rendered invisible from microwaves. The technique used a metamaterial consisting of 10 fibreglass rings covered with copper elements, to deflect the microwaves around the object and restore them on the other side. To an observer it looked like the microwaves had passed straight through the cylinder. Other researchers hope to build the holy grail of cloaking: an invisibility device that would channel light at wavelengths normally visible to the eye. However, this technology is in a more primitive state, according to Dr Sanchez-Dehesa. "We believe the acoustic cloak is more feasible than a similar device for light," he said.